CUPA was founded by Crystal Rogers. She was born on November 17, 1906. Her love for animals began at an early age, culminating in a remarkable career dedicated to animal care and marked by compassion, hope and community. In 1959, she travelled to India en route to New Zealand, but never reached her destination. Appalled by the miserable plight of the animals she encountered, both stray and beasts of burden, she decided to stay on in India and build a sanctuary to house these unwanted creatures. Thus, in 1959, “The Animals Friend" in Delhi was born. Continuing to spread her word of compassion towards all sentient beings, Crystal Rogers moved to Jaipur in 1978 to initiate and build yet another safe haven for animals called "Help in Suffering". In 1978, she was honoured by the RSPCA with the Richard Martin Award for her invaluable contribution to the field of Animal Welfare. Both the Government of India and the Animal Welfare Board of India paid tribute to her unflagging commitment towards animals by presenting her with the Prani Mitra Award (Friends of All Animals). Crystal Rogers influenced an entire generation of young men and women who, today, are actively involved in the field of animal welfare and animal rights issues in India. Noted among them are Maneka Gandhi, Member of Parliament, D.R. Mehta, former Chief of Securities & Exchange Board of India and founder of the Society for Scientific and Ethical Living, Jaipur), Amala Akkineni, founder of Blue Cross of Hyderabad and among others, the current Trustees of CUPA. In October 1991, at the age of 85, Crystal Rogers founded Compassion Unlimited Plus Action (CUPA) at Bangalore. CUPA has since grown to be the largest and most active animal welfare organization in Bangalore. Crystal Rogers passed away on 30th August 1996. 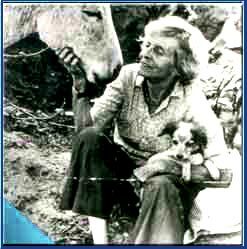 Not only was she the guiding force behind CUPA, but continues to be a source of inspiration to a whole new generation of animal welfare workers and activists. Her book, Mad Dogs and an Englishwoman, chronicling her unique experiences was published by Penguin-India in 2000 is available for purchase through the CUPA website.